These guided trips depart predominantly in the morning, however afternoon departures can be accommodated by advance arrangement. 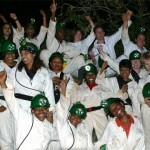 The Gobholo Cave, which is the site of this activity is situated at the top end of the Ezulwini Valley close to Mbabane. The trip includes approximately 1.5 – 2hrs of hiking, and 1.5 – 2.5hrs of caving depending on pace and route choice. After arriving at the cave a safety and technique briefing is offered and thereafter participants are led by the guide through a circular route covering approximately 800m with approximately 200m of vertical ascent/descent. The evening trip is generally the more popular of the two options, as it allows time for sightseeing during the day, before maximising the use of often limited time, by being a great way to fill the evening. It was listed in 2013 in Lonely Planet’s 1000 Ultimate Adventures Publication at #125. Our destination, the Gobholo Cave Complex is found at the head of the Ezulwini Valley, just south of Mbabane. The full trip includes approximately 1.5 – 2 of hiking, and 1.5 – 2.5hrs of caving and an hour or two (or more!) in the hotspring – its notoriously hard to get out! On arrival at the cave entrance a detailed safety and technique briefing is provided. Participants are then guided through a circular route of approximately 800m with +/- 200m of ascent and descent. A feature of this trip, almost as famous as the cave, is the social soak in Ezulwini’s famous ‘Cuddle Puddle” hot spring afterwards, together with steaming hot pizza and cold beer.